This script comes in a single file containing the Animator component, 5 different animation component and 5 easing types. Consult the wsc file for the list and description of each parameter. The animator sample script is a good example of the use of each animation. You are free to use, modify and redistribute the code, provided you reproduce the copyright notice in your documentation (see license for details). 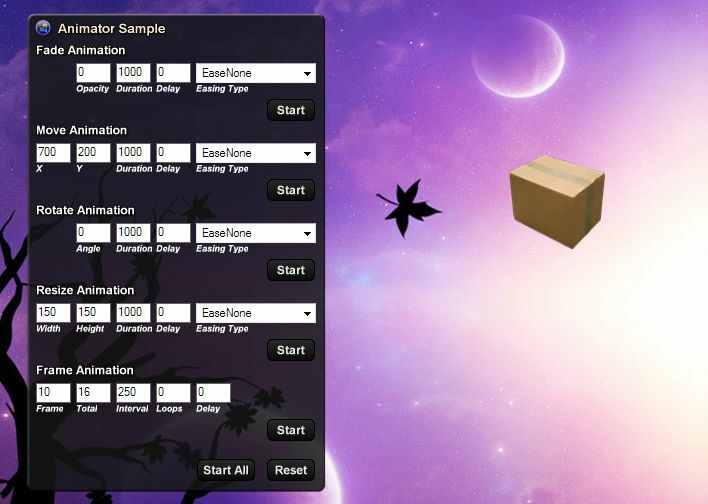 UPDATE: Version 1.1 adds a method to remove all animations linked to a specific object and an option to copy the animation script to the clipboard in the Animator Sample widget. � �This is a really amazing piece of work. Thanks for sharing!